One of the reasons that I chose 40 years ago to attend Oberlin College is that in addition to the regular college, there's a Conservatory of Music. In my hometown, I had been an amateur organist. I had taken piano lessons for twelve years and had been playing the organ at church for six. At Oberlin, I didn't intend to enroll in any Conservatory classes; I envisioned an entirely different career path. Nevertheless, I thought it would be interesting to be around musicians and concerts. And it was. 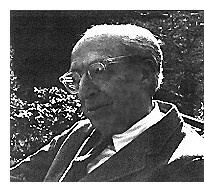 I watched visiting composer Aaron Copland conducting some of his works. At the campus radio station WOBC, I worked alongside Mike Barone, the future host of a public radio series on pipe organs, and I hung out with Chris Rouse, the future composer of not only a Pulitzer-winning trombone concerto but also the Grammy-winning Concert de Gaudí. Click the photos for links to these fellow students, who are now known as Michael Barone and Christopher Rouse. Copland spent four days on campus for the celebration of the Conservatory's 100th anniversary in 1967. I saw him conduct the Oberlin Orchestra at Finney Chapel on Saturday night, May 13. When he lowered his baton at the end of one of his short pieces, we laughed, because the music had merely faded out like a phonograph record. When I returned to Oberlin last month for my 40th reunion, I included the Conservatory in my plans. I decided to take advantage of the various organ demonstrations listed on the schedule. The venues were familiar to me, but since my graduation in 1969, each organ had been replaced with a newer one. However, although the instruments were recently constructed, they were based on the designs of various historical periods. The first demonstration was scheduled for 9:00 on Saturday morning. Early classes on Saturdays always have been problematic, so I actually didn't get to Fairchild Chapel for that one. The instrument is shown above, in an image from the Oberlin website. Dedicated in 1981, it uses organ-building principles of the early 17th century. But I did make it to Warner Concert Hall to snap this picture and hear the demonstration of the next-generation organ, which is based on the Dutch traditions of a century later. To me, its Baroque ornamentation seems out of place in the rectangular, severely modernist hall. The visual styles are at least three centuries apart. As I understand it, the tallest pipes on the side towers are for the lowest pedal tones. Between them is the part of the instrument called the Hauptwerk or main mechanism. I've highlighted two other divisions in color: the Oberwerk or upper mechanism on top, and the Rückpositiv at the bottom. The name of the latter means "back positive," and that means "small organ behind the performer." This Rückpositiv completely hides the organist from view. From the Oberlin College website, here's an angle that the audience can't see. The camera peeks around the Rückpositiv to find David Boe instructing a student. The instrument has four keyboards, including a pedalboard for the feet and three manuals for the hands. 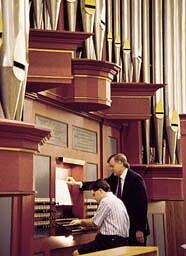 Each manual controls one part of the organ (Haupt, Ober, Rück). In general, to play louder or softer you switch to a different manual. Professor of organ James David Christie, a member of the Class of 1975, described the organ. Built in 1974, it would be worth about $1.7 million today. It has 44 stops (voices or sets of pipes). One of the reed stops, the vox humana, is similar to the Renaissance "regal." He demonstrated the others, plus a subtle tremulant. Later organ designs, Christie told us, used a heavier tremolo. This was especially true of the "theater organs" of the early 20th century, designed to accompany the melodramatics of silent movies. He told a story from his days as organist with the Boston Symphony Orchestra. The BSO had gone on tour to some provincial town, where he would be featured in the spectacular Symphony No. 3 of Saint-Saëns. When the musicians arrived at the auditorium, he discovered that he was expected to perform on a theater organ. He had to plan his "registrations" (which stops to use at various points in the music). So that afternoon he sat down at the console to experiment, apologizing to another soloist who was also there trying out the piano. Some of the organ stops turned out to be train whistles or drums or other sound effects. These drew raised eyebrows from the pianist, but they would not be very useful for the Symphony. Finally Christie got everything worked out, and it was time to switch off the organ. This button, he thought, must be the power. He pressed it and discovered that it actually activated the hydraulics. He found himself and the console being dramatically lowered beneath the stage. But this Flentrop at Oberlin is nothing like that theater organ. It's tuned with a Baroque-period "unequal tempering," which means that music played in common keys sounds very good but music played in other keys, such as F# major, has incorrect mathematical ratios between the frequencies and "will make your hair curl." Musicians of the 18th century had very little chance to practice on the organ, because the boys who pumped the bellows only came in on Sundays. So they had to practice on another keyboard instrument, such as a pedal clavichord. Oberlin has such an instrument for its students. Students can also practice on organs at First United Methodist Church (located next door to the Conservatory) and at the First Church in Oberlin. Through a cooperative agreement, both these church organs are maintained by the Conservatory and its organ curator, Halbert Gober. And that very same Mr. Gober actually constructed the instrument at First Church in 2004. He was on hand Saturday morning to introduce it. The design recalls the Romantic period of the late 19th century. The builder incorporated some old pipes that were once in a 1914 Skinner organ at another local church. I had not been inside First Church in 40 years, but I found the New England-style meeting hall as comfortable and intimate as ever. It's hard to believe that when completed in 1844, it was the largest auditorium west of the Alleghenies, seating 1,800 people. Under its low-hanging balcony, the room doesn't feel nearly that big. 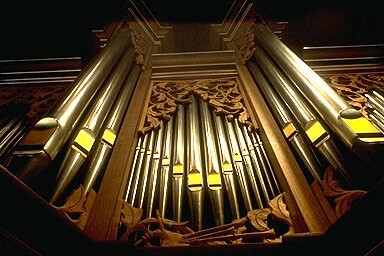 The new organ also has a comfortable familiarity. I recognized immediately two of its stops, the open diapason and the stopped diapason. They sound just like their counterparts on the 1903 organ I used to play back in my hometown, although the Oberlin versions are stronger and more consistent from note to note. 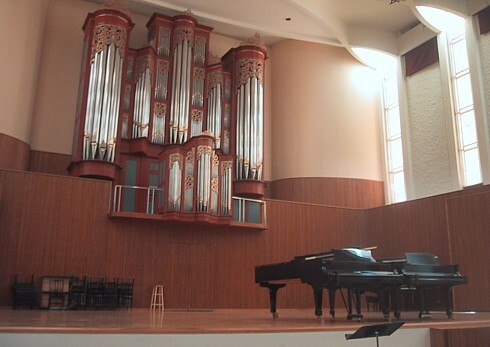 Compared to the Flentrop in Warner Concert Hall, this organ has additional ways to change the volume of sound. For one thing, some of the pipes are enclosed and can be partly muffled with a "swell pedal." There are only two manuals. Rather than switching between them to play louder or softer, the organist varies their sound by adding or subtracting stops. To make this easier, there are various buttons that can call up predetermined combinations. Computers are somehow involved in the programming. In my line of work, television production, this would be like switching the video for a complicated baseball telecast using only two mix/effects banks. The trick is to use memory buttons to store various combinations of video sources for quick recall. One of several demonstration pieces that morning was the Sinfonia from J.S. Bach's Cantata No. 29. 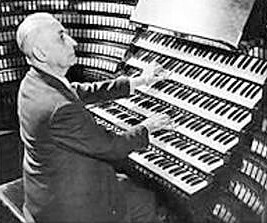 We heard the 1941 transcription by Marcel Dupré (shown here at a slightly larger console). His arrangement is almost orchestral with its gradual crescendos and diminuendos. The First Church organ handled it beautifully. Finally, the Sunday-morning venue was Finney Chapel, the college landmark now 100 years old. Here Oberlin's new president Marvin Krislov would deliver his first state-of-the-college address. 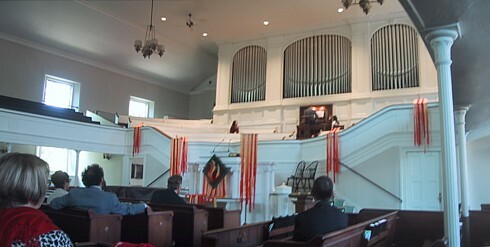 But before the speech, there was the traditional half hour of organ music. The organist was Jeffrey Wood. The next day at the Commencement ceremony, he would receive the Master of Music in Performance on Historical Keyboard Instruments. On Sunday, he played four movements of Louis Vierne's Symphony No. 2. This time, we could easily see the organist, including his feet. The Scherzo movement featured a melody  even a brief duet  played lyrically on the pedals.